Pythian Market is a European-style food market, with 14 different eateries and tables people can sit at and share, in downtown New Orleans, Lousiana. Pythian Market photos. A new foodie endeavor has opened its doors in New Orleans’ Pythian Building. The Pythian Market Food Collective has become a gathering space for anyone and everyone that features local food purveyors, a fast craft bar, and retail vendors. Since its opening in May 2018, Pythian Market has made itself a one-stop destination with an impressive variety of cuisines and drinks to try that accurately represent the diverse culinary landscape of New Orleans. The market is located in the historic Pythian Temple in New Orleans’ Central Business District at 234 Loyola Avenue. The temple was originally commissioned by the Colored Knights of Pythias in 1908, and it has been an “integral role in New Orleans’ early civil rights movement and was a place where the African American community congregated and celebrated,” according to Lisa Brefere, founder of award-winning F&B consulting firm Gigachef and curator of Pythian Market. Brefere’s, and staff’s goals were to recreate this early notion of a gathering place. They wanted to reuse the Pythian Temple for its original purpose, and they have done this by creating a centralized hub of food, culture, spirit, and community. Food halls like this have been delighting people in Europe for decades, now you can visit Pythian Market in New Orleans for the same experience. The food collective has a wide assortment of different eating places that feature locally-sourced purveyors who strive to consistently incorporate fresher and lighter ingredients and flavors. The 14 independent vendors range from local brands that have a following, to up-and-coming new food concepts that seek to push the envelope of comfort food. The unique offerings at Pythian Market include crawfish poutine from a Southern-meets-Louisiana comfort food spot Fete au Fete, the Hanover – oxtails stewed in a rich brown gravy with carrots and potatoes – from 14 Parishes Jamaican Restaurant, Eat Well’s Vietnamese banh mi and phoritos (pho burritos), and cachapas – Venezuelan stuffed corn pancakes from La Cocinita. La Cocinita has also been featured on CNBC’s Restaurant Start-Up, Food Network’s Eat Street, and the Cooking Channel’s Taco Trip. One chef is taking center stage at the new Pythian Market. Chef Marlon Alexander has brought two fresh ideas to the food collective: Cru – raw and cooked specialty seafood dishes including tempura fried Gulf oysters – paired with craft cocktails and wines, and Poulet – fresh sustainable cuisine with an emphasis on locally-sourced rotisserie chicken. Even those who are a little more conservative with their food choices will find something at the Pythian Market. Gourmet grilled cheese sandwiches from Frencheeze, wood-fired pizzas from Meribo Pizza, and traditional Southern barbecue from Central City BBQ are sure to cover the bases for anyone who’s not looking to stray too far into the unusual. Craft drinks can be found at various locales throughout the market. Bar 1908 is the perfect stop for fast craft cocktails, local beers, and seasonal frozen beverages. The Pythian Market is 11,000 square feet with 140 seats and combines contemporary and rustic themes that are reminiscent of the history of the building. Find the perfect New Orleans Hotel at Bonwi, and get points you can use for your next vacation or business trip! The dramatic Four Seasons Hotel and Residences on Lake Pontchartrain, New Orleans. Exciting developments are coming to New Orleans, Louisiana in the next few years. New Orleans is officially becoming home to a new Four Seasons Hotel and Residences. This renovation will be located in the former World Trade Center located in downtown New Orleans. The revived World Trade Center building at the foot of Canal street will include 335 hotel rooms and 92 residences, as well as a grand and junior ballroom, restaurant, fitness room, and rooftop pool. The Four Seasons will also house a proposed museum and attraction that will highlight New Orleans culture with wings looking out onto the famed Spanish Plaza and the Mississippi River. Plans for construction are pointing towards the building of an observation deck that will be a major attraction for hotel guests and city goers who will be able to purchase a ticket for an elevator ride to the viewing deck. The elegance of the Four Seasons is expected; however, an added touch of stylishness can be seen during the evening when the entire exterior of the building is lit up. The new Louisiana Children’s Museum in New Orleans is opening in 2019. This soulful city will also be receiving a new Children’s Museum that is working to change the New Orleans landscape by creating a major educational and visitor attraction that will be placed in a natural park setting. The Louisiana Children’s Museum is planned to be child-centered, family-friendly, and it will become a part of New Orleans’ topography in 2019 with its location in City Park. The museum will be spanning eight and one-half acres with indoor and outdoor environmental elements, which will include decks, bridges, sensory and edible gardens, a floating class, and a restored interpretive wetlands area overlooking one of the well-known Louisiana lagoons. The construction of the new children’s museum kept families in mind with its 56,000 square foot facility that will house five indoor exhibit galleries, a literacy center, and a parent and teacher resource center. Find your own favorite New Orleans Hotel and use Bonwi points for an even better deal. See what else is happening in New Orleans here. If you use Bonwi to book your hotel stays, you’re probably going to earn a big reward payback much faster than with other services. How much faster? Let’s compare how long it would take to get a free hotel room night from Hotels.com compared to Bonwi.com. We picked three cities in the USA and assumed you had a budget of less than $150 per night. Then we looked at how many nights you would have to book to get a free hotel stay in return. With Hotels.com, the rules are easy to understand: stay 10 nights and get one free. “The value of your free night is the average price of the 10 nights you collect.” Once you have completed 10 hotel stays, you can book whatever hotel you want at any time with the credit based on the average stay amount. With Bonwi.com, it’s less simple but that’s because the points you earn are variable. The upside is much greater. Instead of having to stay 10 nights to earn an award, you could earn a free stay after just two or three nights. See some real examples in this video. There’s also upside on the redemption part since the payout is not an average of price paid. Your points may be worth more in some markets than others, so you can cash in faster just by choosing a hotel requiring fewer points. What Would You Get From 10 Nights of Stays? Let’s say you actually do stay 10 nights in hotels over the course of several months. 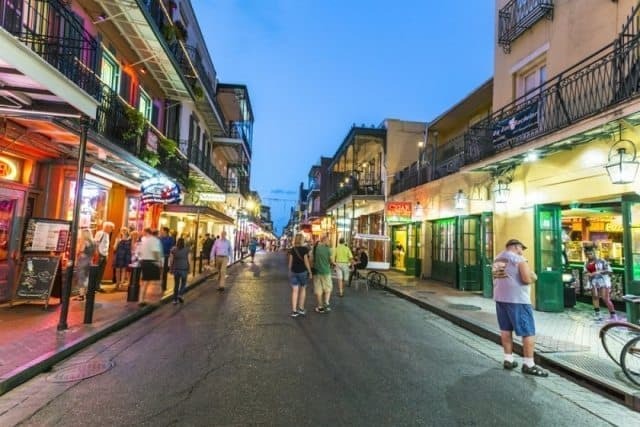 To check out what would happen in a real case scenario, we looked at real booking options for December and January in three well-traveled cities: Las Vegas, Orlando, and New Orleans. If you booked three nights at the SLS Las Vegas, you would pay the same at either site: $391 for three nights with taxes, but really $488 once you factor in the rip-off $32 “resort fee” that really should be included in the rate. With Hotels.com you would earn 3 credits of your 10, or 30% of what you need for a free stay. With Bonwi you earn 9,641 points. That’s enough to actually book another hotel already in Las Vegas the following week: one night at Golden Nugget, Planet Hollywood, MGM Grand, or many others. In other words, 30% of the way to a free night vs. 100% of the way there. If we then book four nights in Orlando at Holiday Inn Express Sea World we’ll pay $304 total with taxes/fees and earn 9,321 Bonwi points. The Ramada Plaza Resort would be $341 for four nights and earn just a shade less. At Hotels.com you would be four credits closer to your free night, but the average comes down because these hotels are cheaper than the one in Vegas: $74 or $101 per night. At Bonwi, once again you’ve earned enough to cash in for a free night in most cities, or you can combine the points with what you earned in Vegas and be at close to 19K–enough for two nights somewhere or one night in a luxury hotel instead. Then let’s say we have to go to New Orleans in January for a trade show. The official hotel is out of our $150 budget range, but either of the choices pictured below will do the trick. For each of them we earn more than 7,200 Bonwi points for our stay. At Hotels.com we pay the same amount and would have finally gotten to our 10 nights. Yippee—we get a free night’s stay! But hold on: that free night is based on the average of what we have spent per night, which comes out to $102 if we picked the Hotel Modern for this last stay and the Holiday Inn Express for Orlando. Their formula would be $341+$304+$378 divided by 10. You can now book a hotel with them that is listed for $102 or less. A $250 gift certificate to Target, Best Buy, Amazon, or the Apple Store. Your rebate value from Bonwi ranges from 25% to 35% depending on how you use the points. Your rebate value from Hotels.com is always 10% and you can only use it for hotels. With Bonwi you can use your points at any time. With Hotels.com they are useless until you have spent 10 nights in hotel rooms booked with them. The winner in this rewards program battle between Hotels.com and Bonwi.com? Well, that depends on whether you prefer to earn a little or a lot. New Orleans, LA: What’s Going on Louisiana’s Biggest City? Instead of lurching down Bourbon Street, discover the swamps outside of New Orleans on a night tour! New Orleans has always been party central while at the same time, is loaded with historical significance. It may be fun to enjoy the insane Mardi Gras festivities or peruse the various ancient mansions, but there is so much more to see and do in the Big Easy. Audubon Park is located on Magazine Street in New Orleans and has almost too many components to list. From jogging and bike paths to tennis courts, a golf course, playgrounds, and even a lagoon, this lengthy park will keep everyone and anyone occupied. Not to mention the 58-Acre Audubon Zoo is just down the road and is home to about 2,000 animals! Why not try a swamp tour…at night. The Honey Island Swamp Night Tour gives tourists the chance to take a chilling flat-bottom boat ride at night. Whether you’re scanning your periphery for gators, listening for the sounds of wild boars or learning about the Honey Island Swamp Monster, this unique tour will have you on the edge of your seat! Take a New Orleans Aerial tour and see the sweep of the Mississippi River and all of the sites of the city from above. Speaking of tours, if you’re not a fan of water or you would prefer not to be so close to snapping gators, try an aerial tour of the city. New Orleans Aerial Tours & Flight Training offers a Big Easy Aerial Tour which allows you to view New Orleans from the sky while simultaneously learning about the city. Take a gander at the twists and turns of the Mississippi River, the Mercedes-Benz Superdome, and Louisiana’s many bayous. The Big Easy couldn’t look any more beautiful than it does from a birds’ eye view! Should you plan on visiting New Orleans, here are some cool hotels that you may want to consider using. The Ace Hotel in New Orleans may not be the only Ace Hotel in the world, but it nonetheless is a stylish and unique lodging option. The Ace Hotel in New Orleans sits in a former department store and boasts a beautiful hand-painted floor as well as voodoo folklore references in each room! The Catahoula Hotel, a 35-room Creole townhouse, makes for a luxurious and authentic stay in New Orleans. The hotel’s café, rooftop terrace, and boutique coffee program may make you forget that the building has been standing since 1845, and will also make you want to stay in the hotel forever! The best thing about booking a New Orleans Hotel on Bonwi is that you get more nights free, using your Bonwi Points!